The security industry is witnessing a rapid evolution in attack techniques - including advanced polymorphic malware and file-less attacks. In fact, according to the 2016 Verizon Data Breach Report, the majority of breaches (53%) involve no malware. Clearly, traditional antivirus (AV) solutions no longer stop advanced attacks. Modern attackers can easily get their hands on the static and highly predictable prevention models used by legacy AV vendors, which means they can reliably bypass them. Unfortunately, many emerging “next-gen” vendors are using approaches that fall victim to the same fundamental flaw. 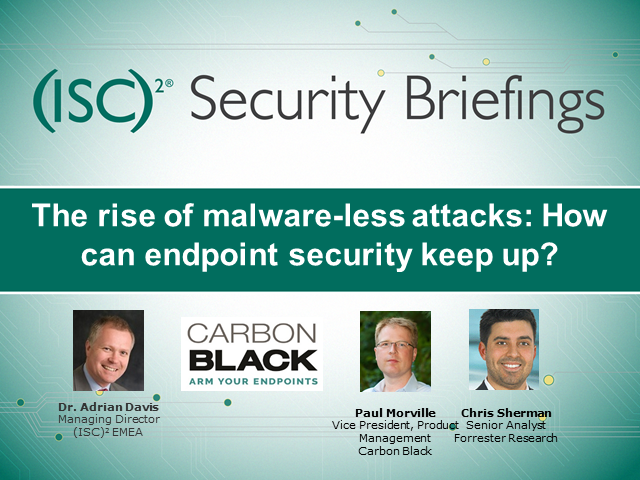 In this webinar with guest speaker Chris Sherman, Senior Analyst at Forrester Research, we will discuss the latest trends in endpoint security, including results from The Forrester Wave™: Endpoint Security Suites, Q4 2016. Carbon Black's Paul Morville will talk about how to stop these pervasive attack techniques. Title: The Rise of Malware-less Attacks: How Can Endpoint Security Keep Up?